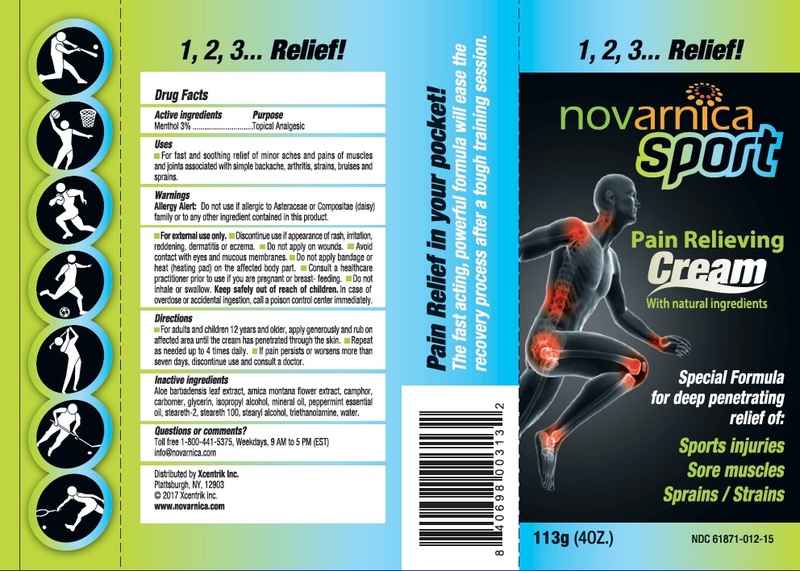 Proprietary Name: Novarnica Sport What is the Proprietary Name? Novarnica Sport with NDC 61871-012 is a a human over the counter drug product labeled by Xcentrik Inc.. The generic name of Novarnica Sport is menthol. The product's dosage form is cream and is administered via topical form. For fast and soothing relief of minor aches and pains of muscles and joints associated with simple backache, arthritis, strains, bruises and sprains. Allergy Alert: Do not use if allergic to Asteraceae or Compositae (daisy) family or to any other ingredient contained in this product.For external use only.Discontinue use if appearance of rash, irritation, reddening, dermatitis or eczema.Do not apply on wounds.Avoid contact with eyes and mucous membranes.Do not apply bandage or heat (heating pad) on the affected body part.Consult a healthcare practitioner prior to use if you are pregnant or breast-feeding.Do not inhale or swallow. For adults and children 12 years and older, apply generously and rub on affected area until the cream has penetrated through the skin.Repeat as needed up to 4 times daily.If pain persists or worsens more than seven days, discontinue use and consult a doctor. Aloe barbadensis leaf extract, arnica montana flower extract, camphor, carbomer, glycerin, isopropyl alcohol, mineral oil, peppermint essential oil, steareth-2, steareth-100, stearyl alcohol, triethanolamine, water.